Air Waves Portrush returns on Saturday 1st and Sunday 2nd September, offering an unrivalled programme of unique entertainment which attracts huge numbers of people to the resort. Organised by Causeway Coast and Glens Borough Council, the two-day spectacular enjoys support from a range of businesses and organisations who recognise the benefits of being associated with the prestigious event. Alongside overall funding from Tourism NI, the event’s Business Engagement Day is sponsored by Invest NI while this year’s STEM Village is supported by MJM Group. The aerial programme is in association with B&E Security Systems (The Typhoon), Arbutus at the Cranagh (Global Stars), Blair’s Holiday Park (Catalina) and Portrush Atlantic Hotel (Wildcat Aerobatics Team). With huge crowds expected throughout the weekend, Council is working closely with Translink to ensure that enhanced rail services and free park and ride facilities (follow advance signage) are in place throughout the weekend. The flying schedule features the Battle of Britain Memorial Flight, RAF Tutor, RAF Typhoon, Calidus Autogyro, Global Stars, RN Sea Fury, Wildcat Aerobatics, Swiss Classic Flight, Huey and Loach, Catalina and the Ulster Gliding Club. Saturday’s programme also includes the Irish Coastguard S-92 and the MiG-15 while on Sunday visitors can look forward to seeing the Red Arrows and RAF Falcons take to the skies over East Strand. On the ground, don’t miss the event’s biggest ever STEM Village with a growing range of exhibitors from the education, engineering and medical sectors and hear from special guest Dr Norah Patten, faculty member at the International Space University and Ireland’s first scientist-astronaut candidate with Project PoSSUM (Polar Suborbital Science in the Upper Mesosphere). 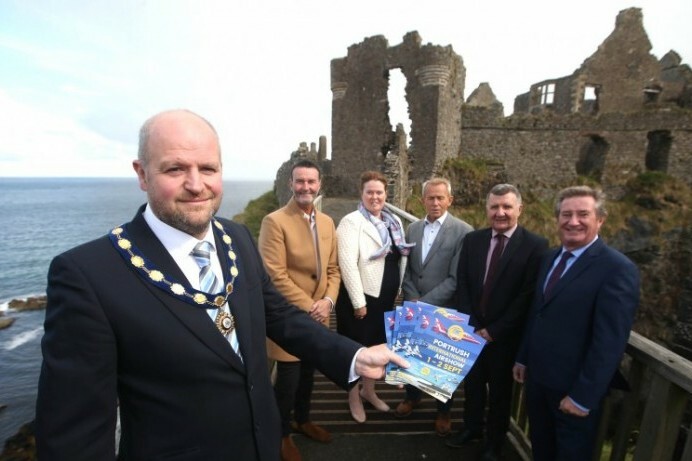 The Deputy Mayor of Causeway Coast and Glens Borough Council Councillor Trevor Clarke is joined at Dunluce Castle by (left to right) Damian Morelli (Morellis), Natasha Garrott, (Portrush Atlantic Hotel), Brendan McIntyre (B & E Security Systems), Sam Todd (Translink NI) and Bill Montgomery (Invest NI) as the countdown to Air Waves Portrush continues. The event returns to the resort on September 1st and 2nd.